Can Russia Keep Its Balance Between China and India? When China and India have shown no signs of deescalating the tensions in the Doklam area, Russia is trying to keep its balance between China and India. 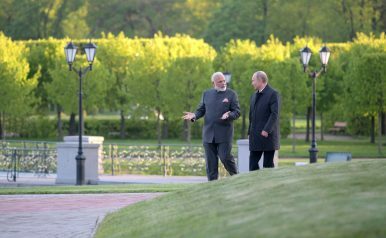 As The Diplomat reported, India and Russia are going to hold a large military exercise from October 19 to 29 in Russia. On August 17, the Russian Foreign Ministry told China’s national news agency Xinhua that the upcoming Russia-India exercise is not against China. Russia does not carry out military exercises or other cooperative events that may lead to worsening relations of a country we maintain multilateral ties with… Russia always provides all interested parties with comprehensive information, in order to stop any speculation on such issues as soon as possible. Another Russian expert expressed something similar to Xinhua, too. What the expert and the spokeswoman said might be true. But they forgot to mention other facts too: that it is the first ever combined force drill, and that it will be located in Russian mountainous far east, which is very close to China. In addition, Russia keeps sending signals to India that the relations between Russia and India are more important than that between Russia and China (although it’s understandable that Russia has never and might never expressed that to China). If the remarks above could still be regarded as a private talk between “two old friends,” Russian President Vladimir Putin’s public statement is definitely an official version of Russia’s position. According to Tass, in the congratulatory message that Putin sent to India’s President Ram Nath Kovind and Prime Minister Narendra Modi on the 70th anniversary of India’s independence, Putin vowed to strengthen privileged strategic partnership and tackle important regional and global issues with India. Other than military cooperation, Russia and India are also planning to boost business in Russia’s far east. Is Russia Benefiting From Tensions Between China and India? China and Russia Sign Military Cooperation RoadmapThe Reality of the Sino-Russian Oil AllianceUzbekistan: It's Time Look Beyond Repression or RadicalismKazakhstan's Teachers: Underpaid, Overburdened, and UndervaluedWhy Was Kyrgyz President Jeenbekov in Germany?